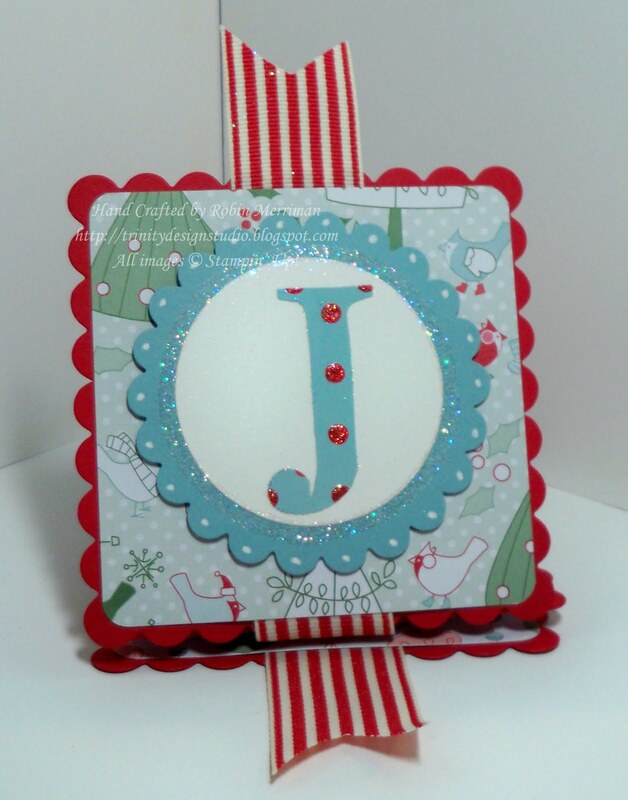 Trinity Designs: December Means "JOY"! December is one of my favorite times of the year! Not only is it time for us to celebrate the birth of Jesus Christ, our Lord and Saviour, but two other very special events in my life take place in December. My Wedding Anniversary and my daughter's birthday! Today, is my nineteenth Wedding Anniversary - yes, Mark and I got married on the 50th Anniversary of Pearl Harbor Day. But hey, don't knock it - he's never forgotten! HA! Here is a photo of us together last December after our Choir Christmas concert at the Harris Pavilion in Old Town Manassas (yes, I have recent ones, but this was handy!). I just have to say how blessed I am to be married to Mark. He is still the love of my life after all these years - in fact, I love him more today than when I walked down the aisle. We've been through so much together, but the key here is TOGETHER. Emma commented the other day that she loves that we are still in love and she thinks it's cool! Well, I think it's pretty cool too! God has truly blessed our lives together and what we lack in material things is more than made up in the blessings of faith, trust, friendship, respect and love. I can't imagine my life without this wonderful man and the Joy he brings to our home! Speaking of Joy - (how's that for a transition?) - here's a card/decoration that I created back in October for my WOW Christmas Card classes. I was saving it for now to share it with you all. That's the closed view - it fits in the Medium Square Envelopes when folded up like this. I love that it can be a fun decoration for the recipient! As you can see, this card/project is mainly done with the Big Shot. I used a variety of dies and for my class, I had pre-cut a lot of the pieces just for time's sake. BUT, if you are making up a bunch of these for yourself, they really don't take that long - honestly! The color scheme is Real Red, Baja Breeze and white - but I used Shimmer White cardstock so it would add a bit more bling! The stamp set for the greeting is Christmas Greetings and the candy canes came from the It's a Cute Christmas stamp set. I used the Real Red Wide Striped Grosgrain Ribbon which runs in between the Candy Cane Lane Designer Series Paper (now sold out - but you could substitute fabric) and the Real Red Scalloped Square pieces. I used Sticky Strip to secure it. The Baja Breeze Scalloped Circles are popped up on Stampin' Dimensionals (3 behind each circle) and the glitter was added with the 2 Way Glue Pen. Each letter is attached with more 2 Way Glue - it holds great! I added the little white dots with the White Gel Pen - and it really makes the card, trust me! my daughter skates with one of her coaches this afternoon, followed by a dinner at the drive through of her choice, followed by her Winter Orchestra concert at school. Not very romantic by some measures, but at least we'll all be together and that, in my book is all that matters! Love your Joy card, Robin. Take a look at mine on my website AND I mail it in the clearance rack CD tins and they stay safe and unwrinkled. Happy Anniversary. and ... What a fantastic card. I am sure anyone would love to receive this. 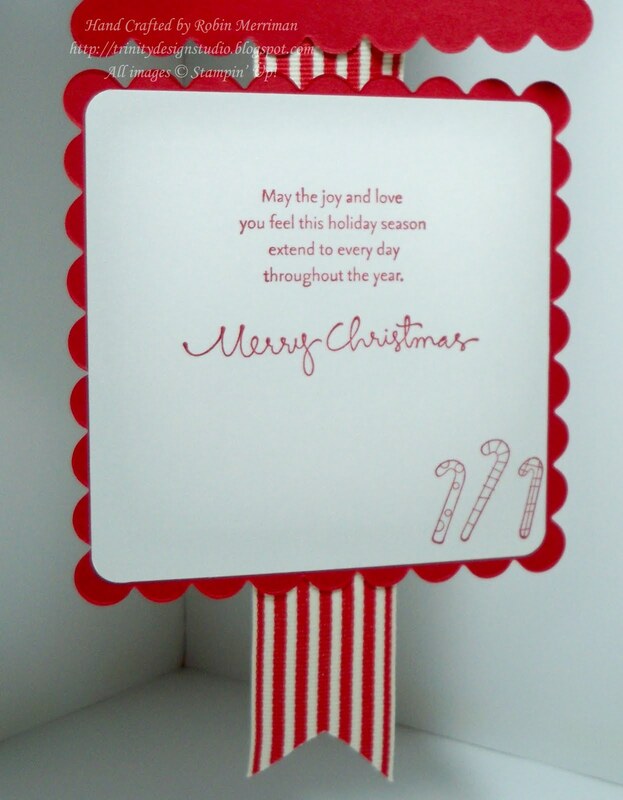 I love a card that does double duty...in this case, it's a greeting AND a decoration! Awesome! Happiness is being married to your best friend....even better when it's lots and lots of years! Congrats, and Happy Anniversary to you both. a very happy anniversary and congratulations! i love it when folks give God all the glory. Your card/decoration is very cheery and i too love how it does "double duty". thank you for sharing! Aloha! Happy Anniversary my friend!! I hope you two had a wonderful day because you both deserve it!!! Tell Mark he is one lucky man (and you are one lucky woman!!!)!!! AND this decoration is just awesome!!! Miss ya and can't wait to see you soon!!! !